Over the next two days I’ll be posting about birds of prey which is an important part of Emirati culture and history and still big business. At Al Maha resort, attending a falconry display is one of the (included) activities to help guests engage with the desert and its wildlife. 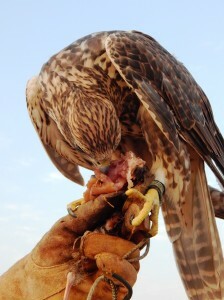 In the past, the Bedouin people used birds of prey to help them hunt for meat to supplement their meagre diet. The Bedouin ate a lot of dates and grassy/vegetable material, but large game was hard to come by in the desert. Small game, on the other hand, came pre-supplied with a specifically and brilliantly evolved predator. 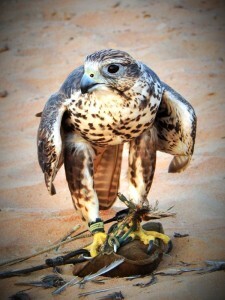 The Bedouin trapped and tamed a falcon to be a hunting aid for their tribe. It was highly prized within their community and (between communities) a good hunting falcon could help their tribe thrive. They caught a smaller wild bird, cut its flight feathers and tangled it in mesh. When a passing bird-of-prey dived on it, it would get caught in the mesh and be captured. Keep in mind this was a thousand years earlier than the operant conditioning/positive reinforcement techniques that Al Maha’s falconers use to train their birds. The Bedouin methods were a little more brutal but super effective. Because 80% of a bird-of-prey’s sensory input comes from its vision, they stitiched the bird’s eyes closed (ouch!) and used the time it took for the stitches to grow out to train the bird to accept food from humans. They would tether the (blinded) bird and train it, first, to inspect food by tapping the bird on the feet and then rewarding it with a food treat when it lowered its beak to inspect. Soon enough, a gentle tap on its feet was all it needed to accept food from humans. In the meantime, it slowly grew accustomed to being handled and to the noise of a human community. As the stitch grew out, the birds eyes would slowly start to open and the Bedouin would then keep it tethered but no longer blinded. By then, the bird knew the hand that fed it (literally) and more often than not it would choose to stay with its primary food source—humans. Food that it caught while hunting when released became its secondary food source and it became used to surrendering its catch to humans. Today, breeding, training and sporting birds-of-prey (especially falcons) is mega business. A good hunting falcon can sell for $50,000. 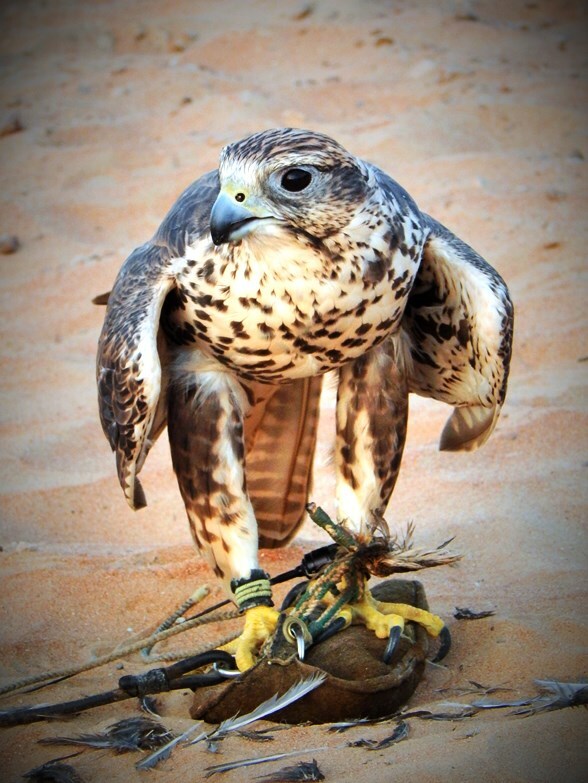 The birds are bred for three qualities: speed/power, aesthetics, hunting instinct and (in the case of the falcons prized in the Emirates) heat tolerance. The best bloodline would have the size, strength and light colouring of the (arctic) Gyr Falcon, the speed and hunting prowess of the Peregrine Falcon, and the heat tolerance of the native desert Saker Falcon. Most falcons in the Emirates are used for display or sports hunting but some are working birds who patrol the skies over some of Dubai’s flashiest hotels to keep the numbers of wild (pooping) birds to a minimum. By flying them regularly around the buildings they provide spectacle for visitors whilst also creating the illusion of a territory for the local birds who then stay away.